inscription: "R. Edwards" printed in black vertically up the lower right edge. 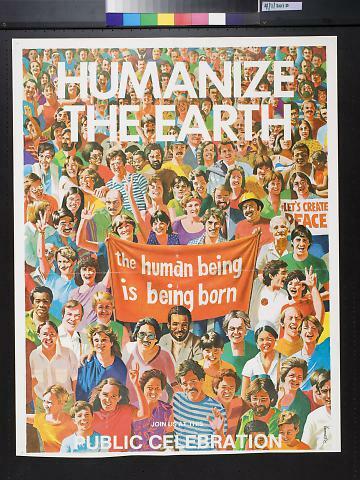 Multicolor poster has a stylized image of a crowd of people smiling and shouting. At the top is "Humanize / The Earth" in white. Near the center is an orange banner with "the human being / is being born" in white. At the right, a woman holds a sign reading "Let''s Create / Peace". At the bottom of the poster is "Join Us At This / Public Celebration" in white.